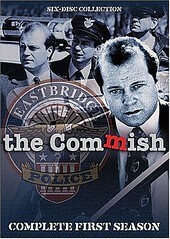 My first reaction when I heard The Commish -- Season One was going to be released on DVD? It was of utter disbelief and even shame. I thought to myself, "Darn, they'll put anything on DVD, won't they? Why then, haven't they put Benson or Webster on DVD? Why, oh why?" But then I opened the six-disc collection containing all 21 episodes from the debut season of this show (which originally aired in 1991/1992 on ABC) and started playing around with it, watching a few of the episodes. I'll admit it, The Commish was always a guilty pleasure for me. I mean, Commissioner Tony Scali (played by Michael Chiklis) was such a nice guy -- a good cop, father, and husband. And his supporting cast seemed real and loveable. The writers and actors/actresses did a good job of making things believable, which goes a long way. But what really turned the tables for me were the interviews with producer Stephen J. Cannell, who is a very informational and entertaining speaker, creator/writer Stephen Kronish, as well as Michael Chiklis, and Theresa Saldana (who played Rachel Scali, Tony's wife). After watching these bonus features found on disc six, I got a renewed interest in the show. Dealing with brutal crimes through humor and creativity, Commissioner Scali never wanes, he always stays on the trail of the culprit, while keeping everything around him rather upbeat and pleasant, marking an anomaly for cop shows, because even when he's down or stressed, Scali never lets it get the best of him -- and comes out smelling like roses. The Commish -- Season One on DVD still makes me think they put anything and everything on DVD, but the show lasted five seasons, so obviously there was a market for it. Beyond putting these on once and watching them, to relive the nostalgia, I don't think I could tolerate watching these episodes over and over again -- or inviting friends over for dinner and drinks while watching these with me. Still, there is something to be said about a show that at 3am, when you can't sleep, entertains you and right when the credits hit, put you to sleep. I'll give it a C.